Andrea di Pietro della Gondola, born 30 November 1508. The Basilica Palladiana in Vicenza. The red plan is Palladio’s design as depicted in his Quattro Libri. The black plan is the structure as built, incorporating elements of the previous buildings on the site. Graphic by Denis of CiA BArch Studio, Manchester School of Architecture. The recent lecture by Peter Eisenman in Liverpool affirmed the current interests of one group of CiA students in the work of Andrea Palladio. Eisenman declared his faith in the value of drawing as a demonstration of thought, in contrast to the thoughtless production of computer generated ‘architecture’. He furthermore asserted that he taught the work of Palladio (along with that of Vignola and Carlo Maderno) as an example of the unity of form and meaning, a relationship which is an increasingly rare commodity. This unexpected endorsement of the playful nature of Palladio’s rules, that discipline of beauty which Lutyens characterised as his ‘high game’, will only amplify interest in an extraordinary body of work which has continued to delight and divert architects for 500 years since Palladio’s birth on 30 November 1508. Here’s to the next 500. 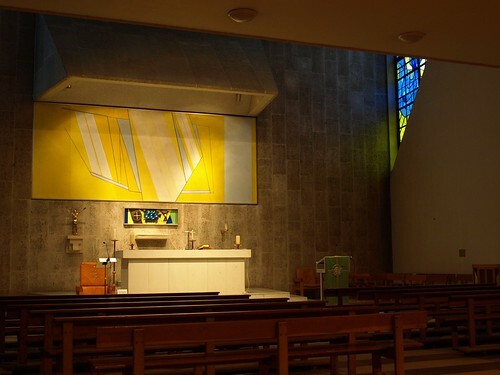 The Historic Churches Commission has refused to authorise the reordering of the Blessed Sacrament Chapel at the Metropolitan Cathedral of Christ the King, Liverpool. The change would have involved siting a new, smaller altar at a lower level. It is difficult to say whether Frederick Gibberd had an underlying geometrical plan for the Blessed Sacrament Chapel that might explain the proportions and position of individual elements. Unity is provided by the combination of colour, line, light and relief in Ceri Richards’ great painted reredos, tabernacle doors and stained-glass windows. The original intention was that Richards would produce an altar frontal as part of the scheme. This was never executed. NB The reredos was too big to be accommodated in Richards’ studio so he painted it in the basement of the Tate Gallery (now Tate Britain). Peter Eisenman or Steve Martin? Summer 1983: A restaurant in the North End of Boston with students from Harvard University Graduate School of Design. Posted on November 20, 2008 Author AventinusCategories Aventinus, CiA, Friends & Acquaintances, Name Dropping, Nostalgia1 Comment on Peter Eisenman or Steve Martin? The models, largely the property of the Centro Internazionale di Studi di Architettura Andrea Palladio housed in the palazzo provide sectional studies of the volumes and spaces of churches, palaces and villas, and amplify the brilliance evident in the superb selection of Palladio’s original drawings (mainly from the RIBA Drawings Collection in London). The narrative sequence of the exhibition works well in the context of its setting and leads both the afficionado and the ingenue through the complex and specific context of work that changed the direction of architecture in Italy and Britain. This is a ‘must see’ show. The RIBA promise a new online resource Palladio and Britain (LINK) coming soon. (Even local Mancunian interest is satisfied for CiA by the presence of a pair of Canaletto’s paintings from Manchester Art Gallery depicting Palladio’s Venetian churches of San Giorgio Maggiore and Il Redentore). In what can only be described as an architectural celebrity bumper period for the northwest, we have been honoured by a number of distinguished guests. Peter Eisenman delivered the RIBA Annual Discourse 2008 at the John Moores University. His lecture entitled: “Textual Heresies: Le Corbusier and the Palais des Congrès-Strasbourg, 1962 to 1964” was an extremely thorough discussion of the building. He also examined the relationship between available technologies and architectural design, not just technology in the construction industry, but also that, which is available in the architects studio. He commented that computers do tend to become the design drivers, complaining that: “Student work all looks the same to me, that’s why I teach Palladio, I don’t know what else to teach”. Apparently the student retort to this one is “Drawin’ Palladio poché aint gonna get me a job in Frank Gehry’s office”. Charles Jencks introduced Peter Eisenman, describing him as “A conscience for architecture”…and… “A thorn in the side of cliché”. I think that we can all agree with that. Preston, England 1926. The dedication of the Cenotaph funded by public subscription and designed by Giles Gilbert Scott. Scott, who was architect of the classic British red telephone box, Liverpool Anglican Cathedral and Tate Modern (Bankside power station), described his design as conforming to the ‘Greek feeling’ of the square, dominated by the Harris Museum. Note the orderly arrangement of military, civic leaders and churchmen around the monument and the crowd funnelled and shaped by the medieval road beyond. The sailors on the right are quite variable in stature compared to the soldiers on the left. Ungraspable statistics dominate descriptions of the Great War. John Ptak has a number of excellent posts about crowds, and, through old photographs, is attempting to put a “fleshy face on an otherwise forensic statistic”. See 20,000 Soldiers & 1 Mule, 1918 and 100,000 People at the Dempsey-Carpentier Fight, 1921: a Remarkable Photograph. 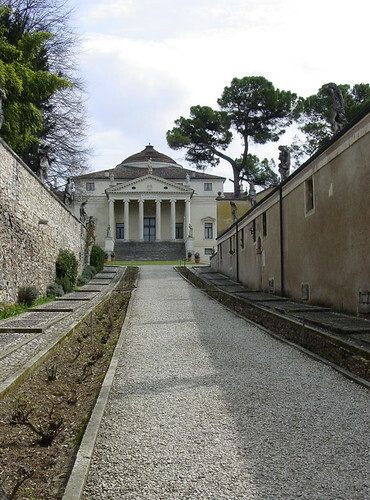 Palladio’s Basilica in Vicenza is undergoing an intensive period of restoration. The stonework is being cleaned and repaired and the famous curving roof is being replaced. On a recent CiA visit it was possible to witness the individual sections being lifted into position. A tour guide was overheard explaining that during WW2 the roof of the Basilica was damaged. Immediately after the war it was replaced with a concrete structure. Over the last sixty years, this has created problems of its own: the internal structure was starting to sink! It was therefore decided to replace this structure with a wooden and metal construction that is not dissimilar to the original. If you are visiting, CiA recommends the Ristorante Al Pestello, a small restaurant that serves delicious, traditional Vicenzan food.